Radical Suburbs: Experimental Living on the Fringes of the American City, by Amanda Kolson Hurley. At least, that's what Amanda Kolson Hurley, a senior editor at urban news site CityLab, wants you to do. Kolson Hurley is well-acquainted with suburbia's numerous negative stereotypes—some of them, such as racial segregation and ecological threat, all too valid. 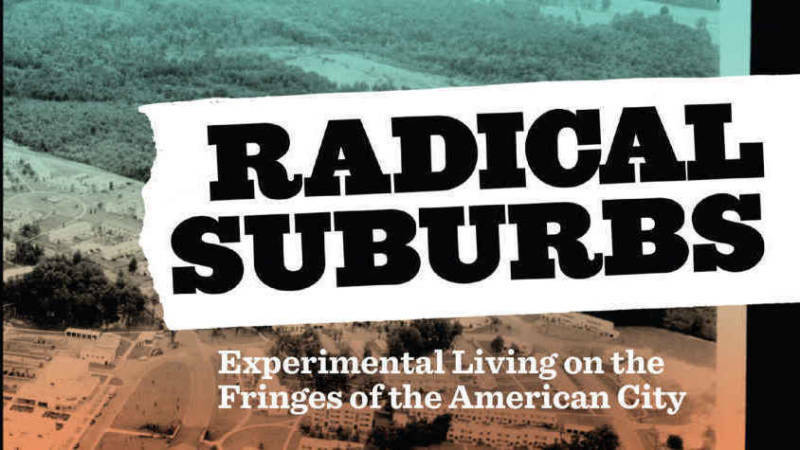 But in Radical Suburbs: Experimental Living on the Fringes of the American City, Kolson Hurley sets out to reveal a different side of the vast patchwork of not-quite-urban, not-quite-rural zones in which more than half of Americans live. She makes a great case that such a vision is vitally necessary. "Rising social inequality and demographic shifts—and above all climate change—make it imperative to rethink who and what our suburbs are for," she writes. With unapologetic idealism, she looks forward buoyantly to the results of that rethinking, anticipating changes such as creative tax breaks to encourage diversity, improved enforcement of the Fair Housing Act, and an increase in co-housing and other unorthodox—but equitable and eco-friendly—living arrangements. When she knowledgeably describes workable solutions, her enthusiasm is contagious. "Simple design changes to connect [suburban apartment] developments to nearby commercial areas [have] made residents more than 60 percent more likely to walk rather than drive there," she notes. "Rather than slavishly pursuing new construction ... forward-thinking suburbs could redevelop ... 'grayfields' instead: dead malls, aging strip malls and high-vacancy office parks." In Trevose, Pa., there's Concord Park, built by socialists and Quakers in 1954 to challenge housing segregation. Its mix of black and white families—as well as several interracial ones—gave the country a model integrated community at a time when such a thing seemed utterly unimaginable. In Lexington, Mass., there's Five Fields, designed in the early 1950s by proteges of Bauhaus founder Walter Gropius. Its layout harmonizes with existing natural features and promotes neighborly bonding by providing ample common land. And there's Stelton, N.J., founded by anarchists in 1915. In its heyday, collective matters were decided by vote—children included—husbands and wives weren't always legally married and the locals "sometimes refuse[d] to stand for the national anthem at the movie theater in New Brunswick." There's also Economy, Pa., Greenbelt, Md. and Reston, Va.—all places where high ideals were allowed to triumph, however fleetingly, producing ways of life that residents would remember as uniquely stimulating, communal and humane. "Humane" is Kolson Hurley's word, an inspired adjective to evoke a sense of what, ultimately, we really need our living spaces to be. Her stories demonstrate what the unfettered human spirit can achieve when it's at its best.